FEATURE — Synergy is the benefit that results when two or more agents work together to achieve something neither agent could have achieved on its own. The concept of the whole being greater than the sum of its parts is the simple premise that has been the backbone of Synergy Massage & Personal Fitness in St. George. Our team of massage therapists and personal trainers work together to provide people with unique therapeutic massages and fitness sessions to overcome a variety of issues. As a personal trainer and massage therapist, I saw the need to provide a dual environment where massage therapies and physical movement are applied to facilitate healing, recovery and overall well-being. In this process, the client is educated in self-care techniques and provided with a plan that includes massage therapy, post rehabilitation and personal coaching to facilitate the journey of wellness. Synergy Massage & Personal Fitness provides a place where individualized attention in a private atmosphere gives the client a sense of empowerment and partnership. Some of our greatest joys occur when someone walks without using a cane, recovers from a car accident, experiences relief from pain or moves a limb in a full range of motion again. One recent case is that of a young girl, age 13, who had a kneecap displacement resulting in torn cartilage. When she came to Synergy after her surgery and six months of physical therapy, she still could not function without pain. Her goal was to dance again pain free. We began the process of testing and assessing. When she contracted her thigh muscles, her knee would “J” to the side, causing her great discomfort at the joint hinge when she ran, stood up, walked up and down stairs and extended her leg. 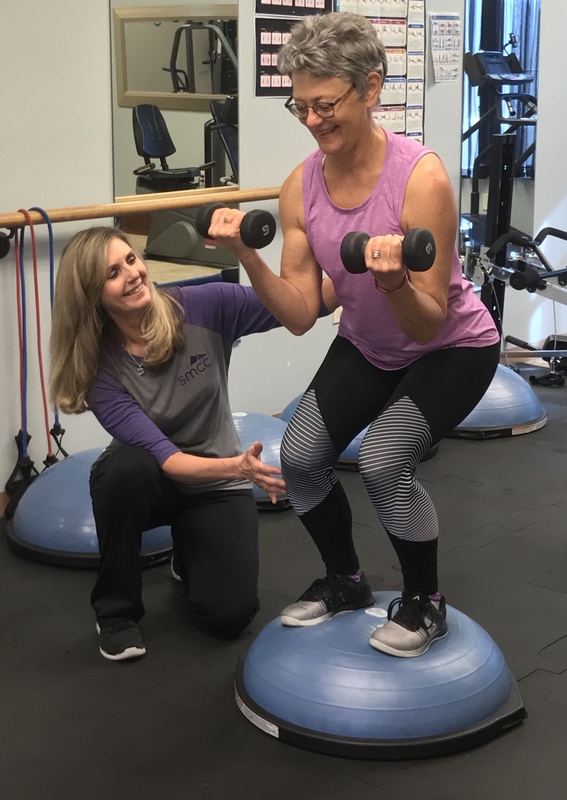 After meeting with our injury and prevention trainer, Terese Schelling, for assessment and initial functionality testing, she was treated by massage therapist Rhonda MacFadzen for tight vs. slack muscle tone and function. The assessment showed that the outer thigh was pulling the knee up and to the side while the weaker inner thigh was not strong enough to assist. The hamstrings were the opposite in function: the outer hamstring was slack and weak while the inner hamstring was overpowering. All this created a sort of torque in the leg that also contributed to an internal rotation. Treatment in massage therapy included trigger point release, fascial line release, massage cupping and stretch. The first session resulted in some relief in painful knee extension, but the strength and movement to complete a knee extension was still lacking. Terese’s testing indicated that the girl’s left quad showed atrophy above the knee, and she was unable to engage the girl’s inner thigh muscle or the left buttock muscle. Pain levels ranged from 4–9 on a scale of 1–10 during ¼ squats and step-downs. Knee extension over a soft ball was the most painful, and the girl needed assistance in bringing her surgical leg back down towards the floor. After only five weeks of training, the girl showed improvements in range of motion, stability and strength in the left knee. At eight weeks, she was able to complete chair squats without pain, perform knee extensions without pain and perform step downs and regular squats with a low level of discomfort. This success story demonstrates the many ways Synergy Massage & Personal Fitness uses its knowledge and skills to overcome a variety of complex issues. If you or someone you know needs our help, call our office, or go online to schedule an appointment.